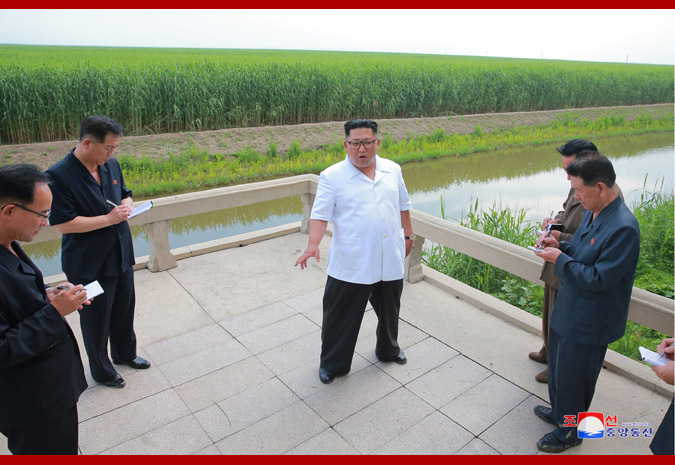 Pyongyang, June 30 (KCNA) -- The respected Supreme Leader Kim Jong Un gave field guidance to Sindo County, North Phyongan Province. He inspected Field 14 of Reed Branch Farm 1 of the Sindo County Combined Reed Farm visited by President Kim Il Sung and leader Kim Jong Il. 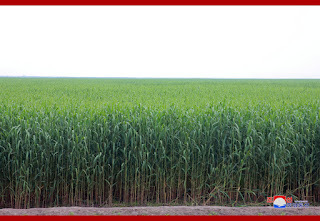 He said that if the production of chemical fiber based on reed is to be reenergized, it is necessary to spruce up Sindo County as befitting a large-scale reed production base, put the reed cultivation on a scientific and modern basis so as to increase the per-hectare yield of it and settle the reed transportation issue in order to supply enough fiber materials to factories. 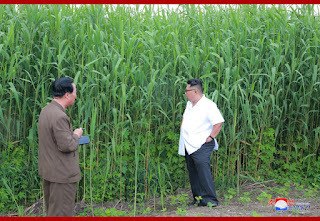 Noting that to turn the county into a reliable Juche-based chemical fiber materials base and increase the reed production is an important work for further strengthening the independence of the country's chemical industry, he said that he would positively help it and called for raising good reeds to keep its production going at the rate of the peak year and continuing to reap the rich harvest in the future. 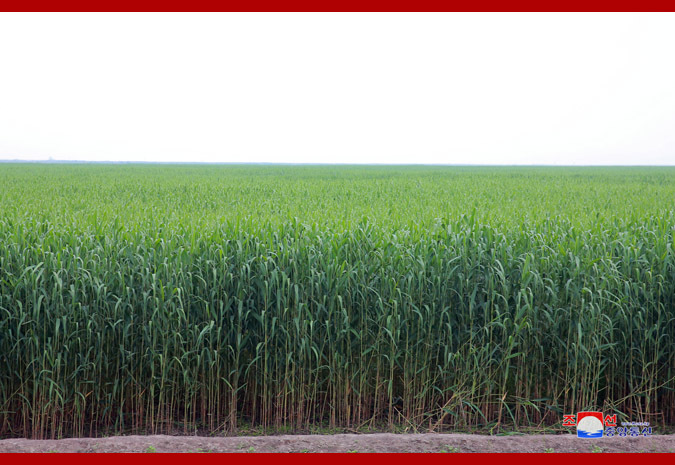 He set forth detailed tasks and ways for bringing about a fresh turn in the reed cultivation. He said that he would send high-powered tractors and other vehicles to the county, and assigned the relevant sector to tasks to preferentially provide the county with fuel oil, tyres and accessories for vehicles, learn about the conditions of generating and pumping equipment and tugs and lighters and take steps to maintain them and work out to provide new ones and help it in a responsible manner. 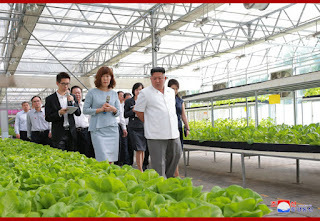 Then he toured the mechanized workteam of Reed Branch Farm 1. He called for using farm machines and implements with care and taking good care of them in a responsible way and repairing and maintaining them in time and making effective use of them by enhancing the responsibility and role of the users and thus positively mechanizing all the farming processes. 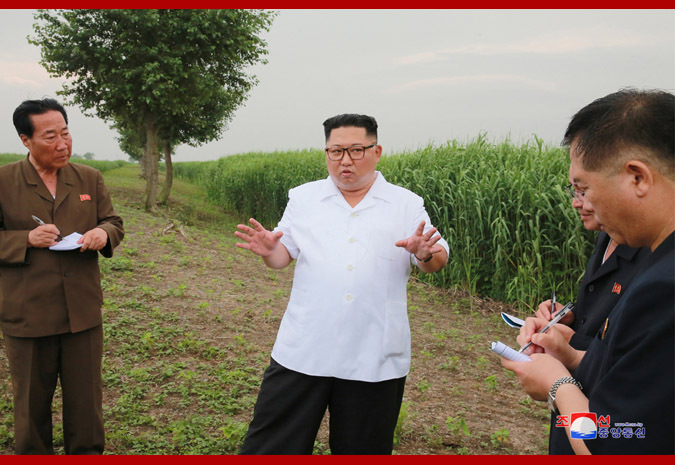 After learning in detail about the conditions of Sindo County as a whole, the Supreme Leader advanced highly important tasks facing the county. 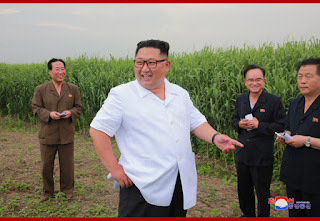 Saying that it is important for the remote island to lay a reliable supply service foundation for it, he underlined the need to increase the grain production and reenergize the stockbreeding and fishing bases so as to turn the county into the one with mighty means of living that can produce and supply all things necessary for its economic life independently. Stressing the need to build up the county people's hospital on a modern basis like a big one in a city in order to cure patients by itself, he said that the hospital should be provided with complete sets of medical equipment to perform most operations. It is also needed to spruce up primary and middle schools in the county and remarkably improve the educational environment and conditions so that the inhabitants in the island can lead a highly civilized life like those in a city, he said, making sure that the powerful building force of the People's Army is mobilized to rebuild the people's hospital and schools in the county into model and standard units in the public health and educational fields. And he on the spot took measures to provide the necessary materials. Working heart and soul to provide the inhabitants in the island county with more convenient and civilized living conditions, he promised to send buses and other vehicles in consideration of their traffic conditions. 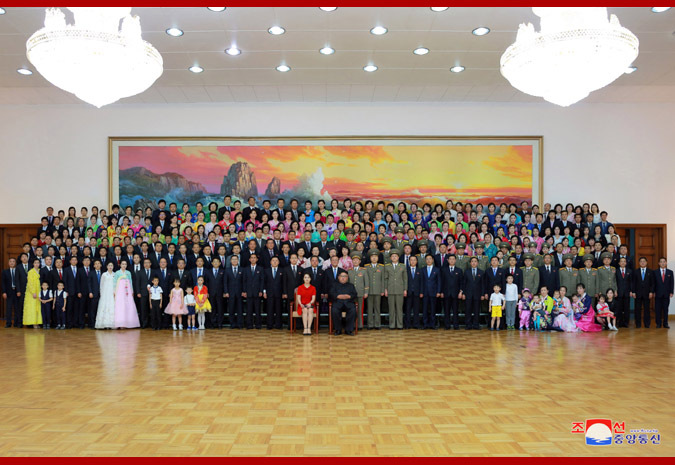 Today is the 2nd anniversary of respected Marshal KIM JONG UN's election as Chairman of the State Affairs Commission of the DPRK . 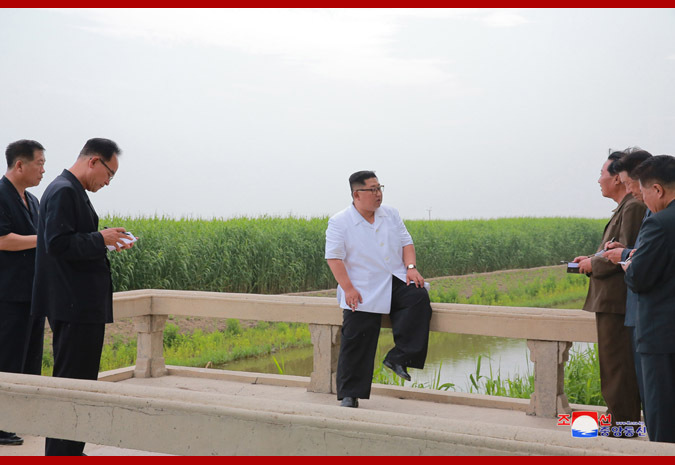 For the past two years Chairman KIM JONG UN has led the Juche revolution along the road of victory. 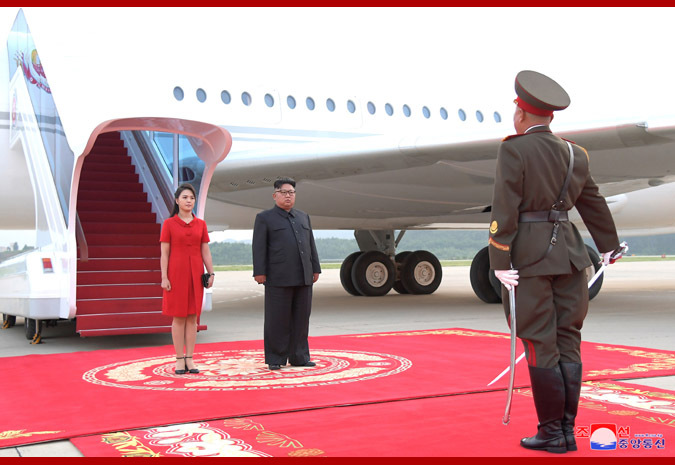 Glory to respected Chairman KIM JONG UN ! Juche Korea-the Democratic People 's Republic of Korea (aka north Korea ) is one of the most misunderstood countries on the earth . This exhibition organised by the UK Korean Friendship Association will give an opportunity to gain a better understanding of Juche Korea. 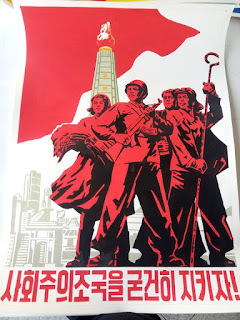 We will be exhibiting some original hand painted posters from the DPRK .Posters in the DPRK has an important social function as well as an artistic and cultural one . Through the posters of the DPRK one can see the society of the DPRK mirrored in them and its values, aims and concerns. 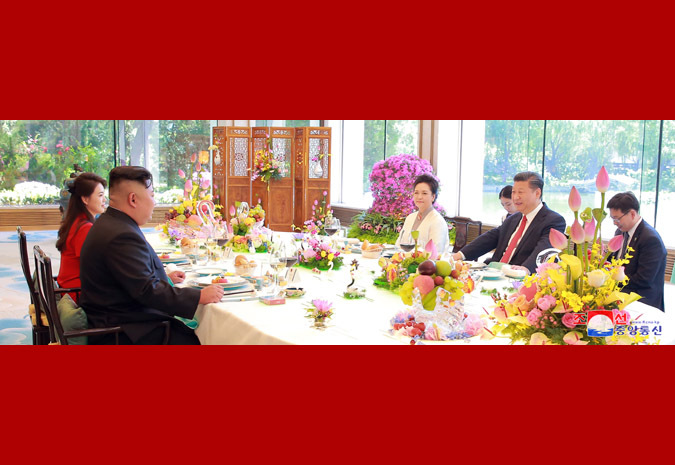 It is 2 years since the dear respected Marshal KIM JONG UN was elected as Chairman of the State Affairs Commission (SAC) of the Democratic People's Republic of Korea by the Supreme People's Assembly of the Democratic People's Republic of Korea . 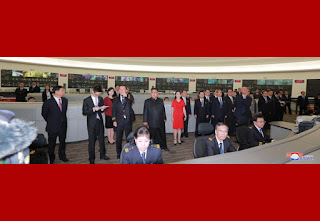 This reflected the will of the entire Korean people who wanted respected Marshal KIM JONG UN as their leader. 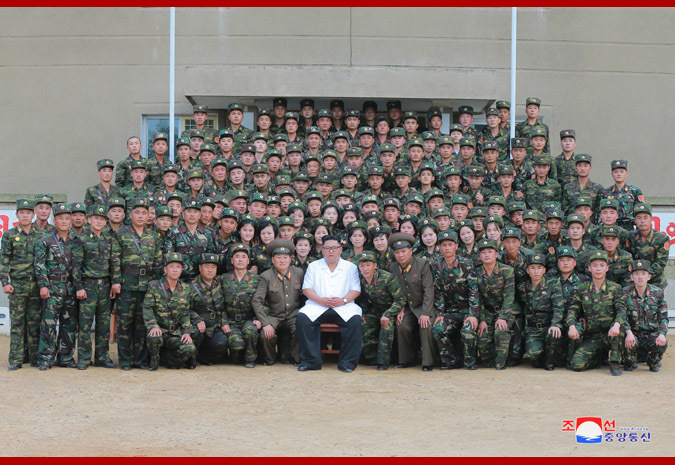 Much rubbish is written in the Western imperialist mainstream media about the DPRK and its system of leadership. Some of it is deeply offensive and some of it is downright silly. In the DPRK no -one can be elected to the Supreme People's Assembly by a minority of the electorate but in the Western capitalist democracies this happens all the time, whereas in People's Korea deputies to the Supreme People's Assembly are elected with by a 100 per cent of those voting which usually comprise 99.9 per cent of the electorate. 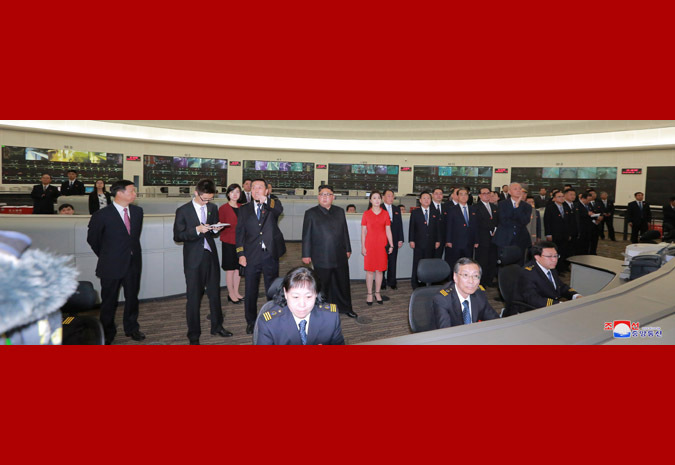 Thus respected Marshal KIM JONG UN's election as chairman of the SAC reflected the will of the people. 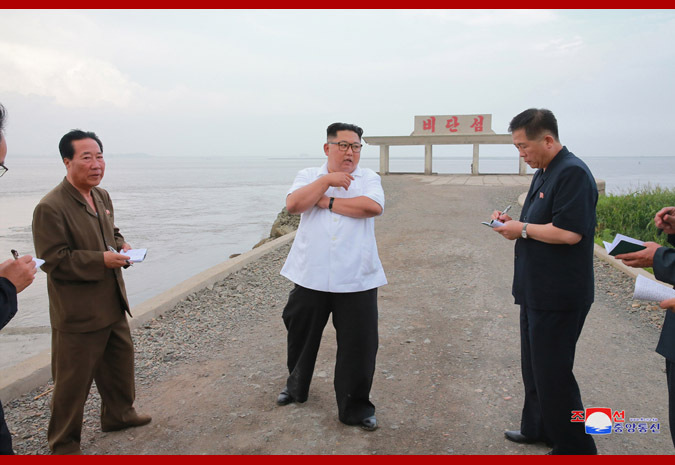 Unlike the armchair politicians of the capitalist countries respected Marshal KIM JONG UN goes amongst the people all the time giving on-the spot guidance. This is why he has their support and trust and is a people's leader In 2016 when the north western part of the DPRK was ravaged by severe floods during the late summer , respected Chairman KIM JONG UN went and visited the affected areas to see the reconstruction in person . He also guided the construction of new streets in Pyongyang such as Ryomyong Street , a street which had literally risen out of the bare earth and is the size of a small city . 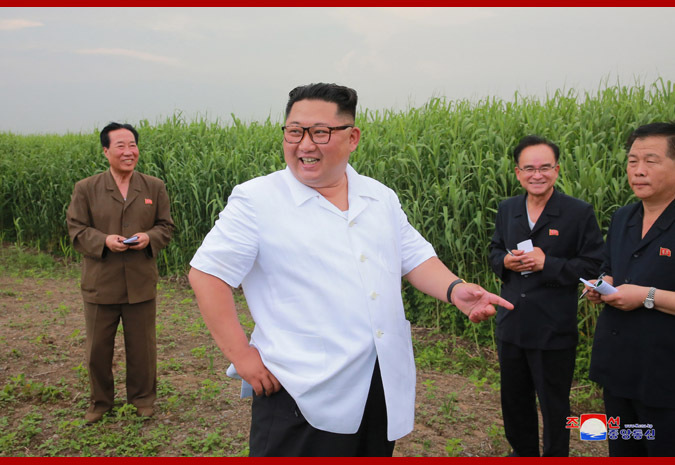 Under the leadership of respected Chairman KIM JONG UN the DPRK victoriously concluded the work of building the economy and nuclear force in parallel and has now embarked on the road of socialist economic construction under the banner of self-reliance . Respected Marshal KIM JONG UN defined self -reliance as " the core and main principle of the new revolutionary line"at the 3rd plenary meeting of the 7th Central Committee of the Workers' Party of Korea.
. During the past year it has been noticeable that respected Marshal KIM JONG UN has carried out bold diplomacy and raised the international prestige of the DPRK , even meeting the president of the US ,something which seemed completely impossible and surreal but it happened nevertheless thanks to the bold . 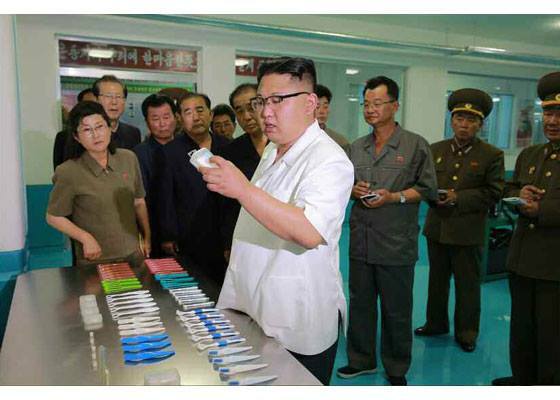 Juche-based diplomacy of respected Chairman KIM JONG UN. There were also more than one visit to the neighbouring country , China , with whom relations had become strained but thanks to the efforts of respected Chairman KIM JONG UN they improved considerably . He also had talks with the leader of Singapore . 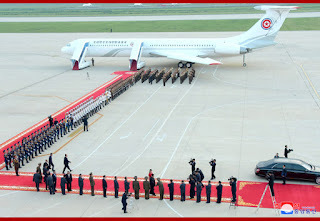 It is hoped that respected chairman KIM JONG UN will meet Putin the president of the Russian Federation and also President Assad of embattled anti-imperialist Syria. 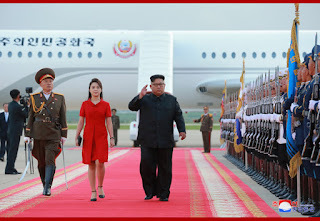 Respected Chairman KIM JONG UN has made a decisive breakthough for the cause of reunification by holding the 3rd and 4th inter-Korean summits at Panmunjom in April and May . 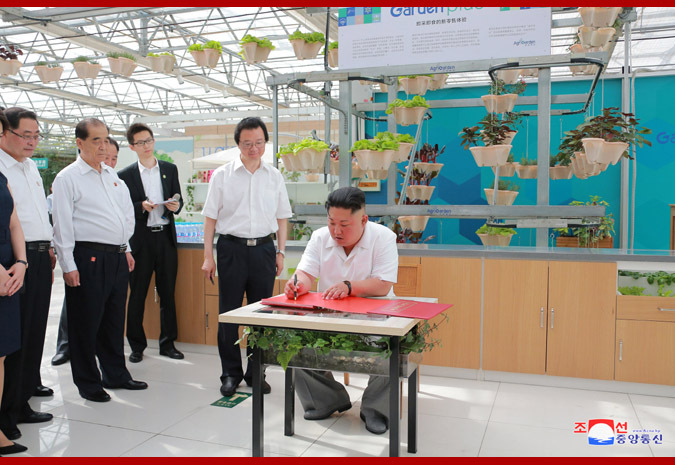 Thanks to respected Chairman KIM JONG UN a new era of peace , reunification and prosperity has been opened up. Now because of his adroit and energetic diplomacy . respected Chairman KIM JONG UN is now throughout the world as "Chairman Kim" , in fact Chairman Kim has become a household name . 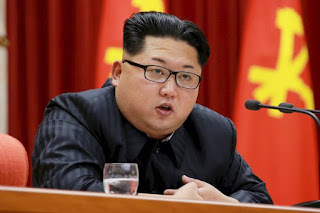 Everyone knows the name of KIM JONG UN, the chairman of the State Affairs Commission of the DPRK .Few people know the name of the Japanese prime minster or the south Korean president but the name of KIM JONG UN is known by everyone young and old ! 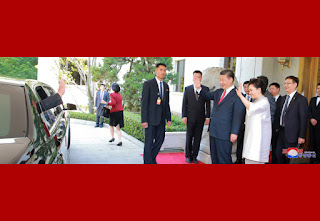 Looking on the past two years since respected Marshal KIM JONG UN was elected as the Chairman of the DPRK SAC one can conclude that the People's Korea has a bright future under his vigorous and dynamic leadership. 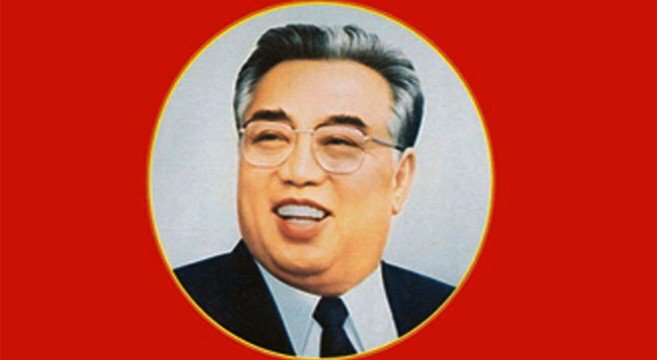 It is nearly a quarter of a century since that fateful day in July 1994 , the shining light of the memory of the great leader President KIM IL SUNG is undimmed.We Juche Idea followers, Songun idea followers and true friends of People's Korea in the UK recall his great exploits with deep pride. The great leader President KIM IL SUNG worked all his life for the independence of the people. . He was a tireless fighter who battled against imperialism all his life, leading the Korean people first against the rapacious Japanese imperialists, then against the barbaric US imperialists . 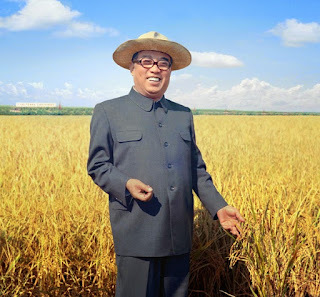 President KIM IL SUNG waged a 15 year long armed struggle against the Japanese imperialists becoming a legendary general distinguished by his adroit guerrilla tactics.He gave the Korean people independence and liberation ,something that is so precious it cannot be bartered for billions of tons of gold bullion. President KIM IL SUNG was the ever-victorious iron-willed brilliant commander and gifted military strategist who defeated the US imperialist aggressors who had tried to crush People's Korea when it was in its cradle .Thus again he defended the independence of the people. 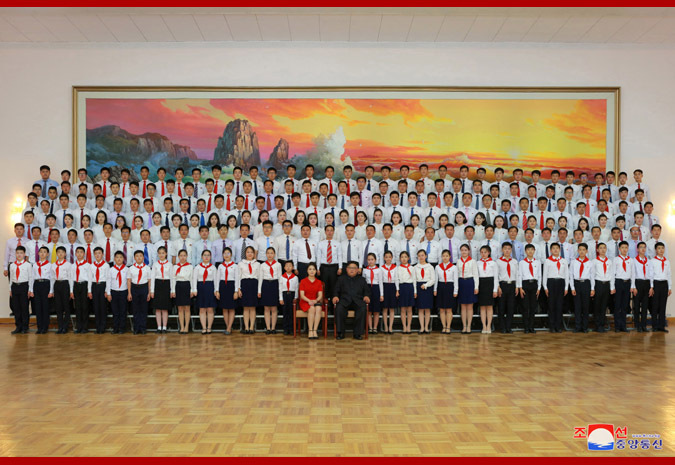 Under the leadership of the great leader President KIM IL SUNG ,two stages of revolution were carried out : the anti-imperialist,anti-feudal democratic revolution and the socialist revolution.He founded the Democratic People's Republic of Korea (DPRK) , an unique socialist state of Juche centred on the popular masses ,a peoples paradise.The DPRK has proved to be a most durable ,stable and harmonious socialist state. The great leader comrade KIM IL SUNG ensured that Rightist and Leftist deviations were avoided in the construction of socialism. 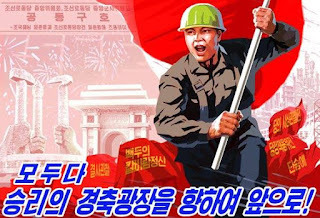 Moreover socialism in Korea was not a copy of another country but Korean-style socialism, an independent Juche socialism. 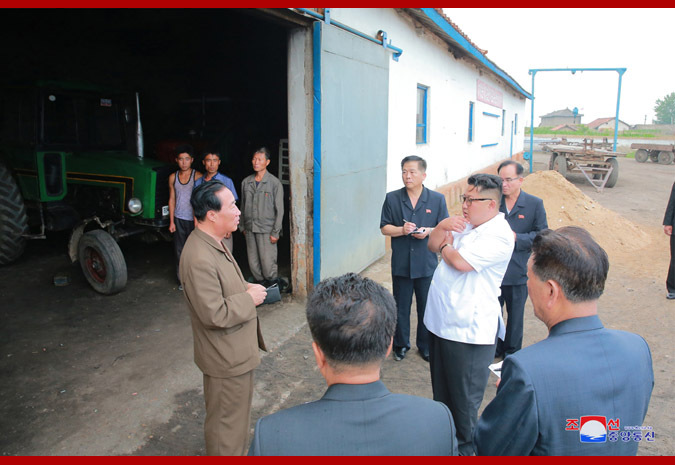 The DPRK upheld socialist principles when others introduced capitalist-style methods. 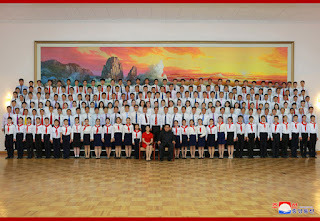 Independence, independence and independence was the creed of the great leader President KIM IL SUNG . 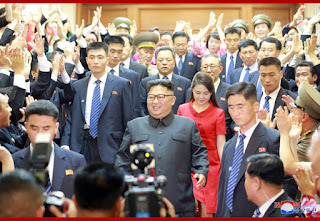 He authored the Juche Idea which lights the road of independence for the popular masses and teaches us that man is the master of everything .The Juche idea captivated the anti-imperialists and revolutionaries throughout the world .Thousands of seminars on the Juche idea have been held all over the world. 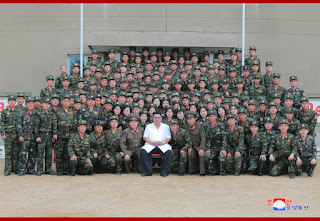 The Songun idea initiated by the great leader generalissimo KIM IL SUNG in the fiery days of the anti-Japanese armed struggle is based on the concept that independence is achieved by arms and the victorious revolution is defended by arms .The Songun idea , which has been implemented by the worthy successors of the great leader generalissimo KIM IL SUNG, eternal general secretary KIM JONG IL and dear respected Marshal KIM JONG UN , is the treasured sword that defends the independence and dignity of People's Korea the bastion of world socialism. The great leader comrade KIM IL SUNG always struggled uncompromisingly against US led world imperialism .. He upheld unity against division when others split the international communist movement and socialist camp. The great leader comrade KIM IL SUNG held high the red flag of socialism when others abandoned it. He was a great revolutionary true to his faith until the very last moments of his life. President KIM IL SUNG put forward the line of global independence and was known the sun of the world revolution. 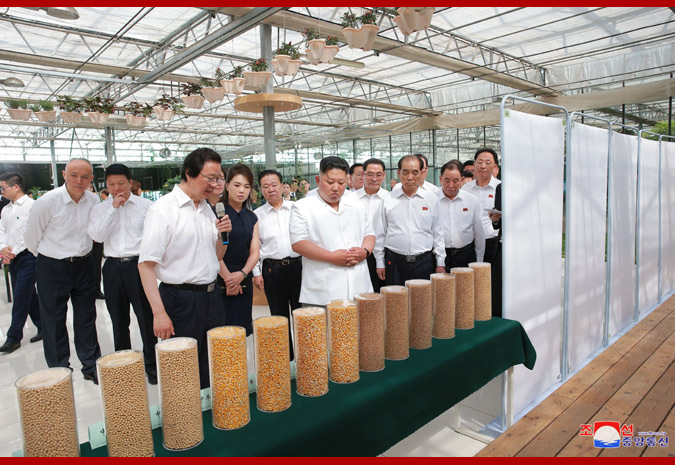 British Committee to Remember the great leadercomrade KIM IL SUNG. great leader comrade KIM IL SUNG . 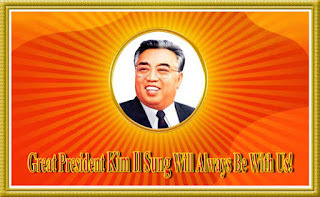 The passing away of the great leader comrade KIM IL SUNG was a painful and heart-rending loss for the Korean people but also for the world progressive people . It was also a loss for British progressive people who study the Juche Idea and took inspiration from People's Korea ,the land of Juche , a country of robust independence, which was founded by the great leader comrade KIM IL SUNG . 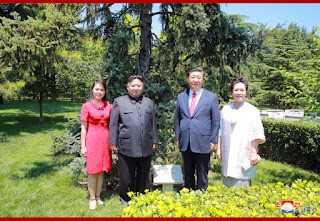 The great leader comrade KIM IL SUNG was the greatest of great leaders , a true elder of the international communist movement and renown world statesman. The great leader comrade KIM IL SUNG always upheld independence throughout his life always opposing imperialism of all kinds ,dominationism and big-power chauvinism. He fought for global independence and the victory of the world revolution. The great leader comrade KIM IL SUNG opposed the division of Korea by outside forces such as the US. He put forward many realistic policies to achieve reunification on the basis of independence, peace and unity. 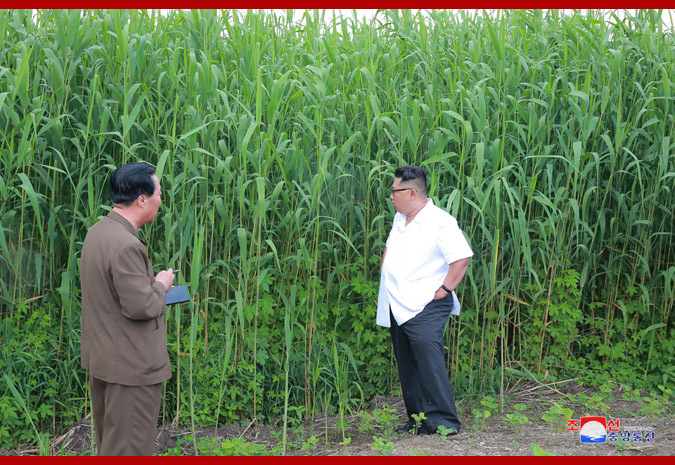 KIM IL SUNG and his great legacy . 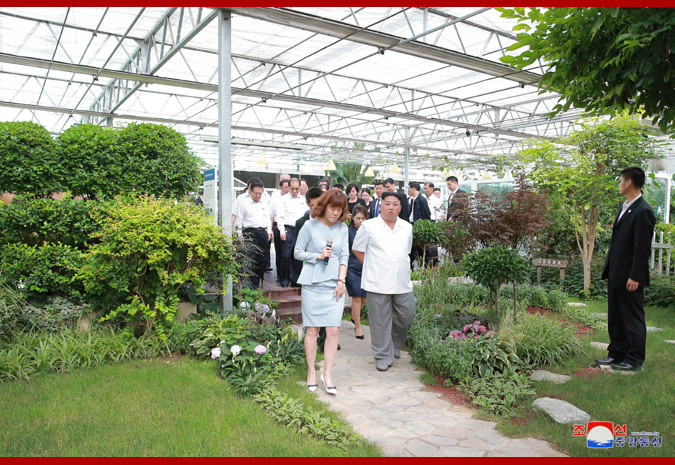 Pyongyang, June 26 (KCNA) -- Japan is just thick-headed in politics though it is allegedly good at finance. Prime Minister Abe recently appeared in a TV show and talked such rubbish that Japan is willing to bear the "expense for the dismantlement of north Korea's nukes". It seems that Japan wants to have a share in the rapid process to settle the issue of the Korean Peninsula by showing off its purse. 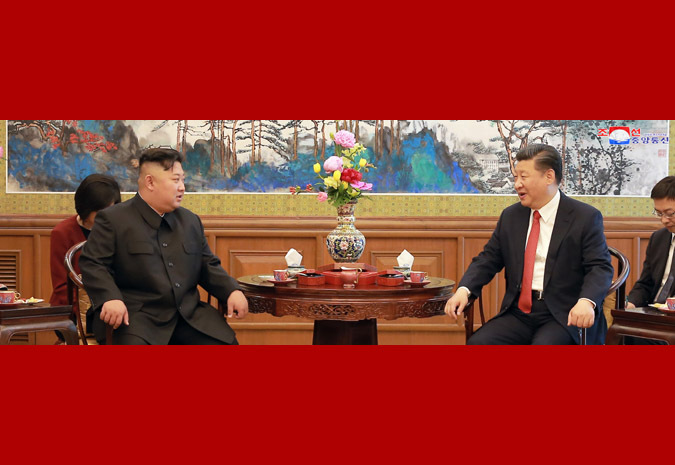 It is a well-known fact that Japan is now mired in the self-contradiction as it has doggedly resorted to pressure on the DPRK against the trend of the times until recently. Japan should know what should be done first, though it gets the jitters. 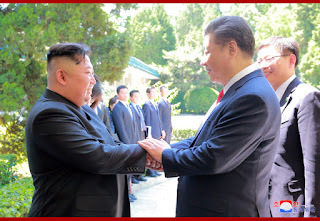 What is basic in the DPRK-Japan relations is for Japan to atone for the past crimes. Japan is legally and morally obliged to make a sincere apology and reparation for the past history of the colonial rule the Japanese imperialists enforced by illegally occupying Korea in the 20th century. Japan can never evade this responsibility as it is just a historical problem which had to be resolved with the end of the Second World War. 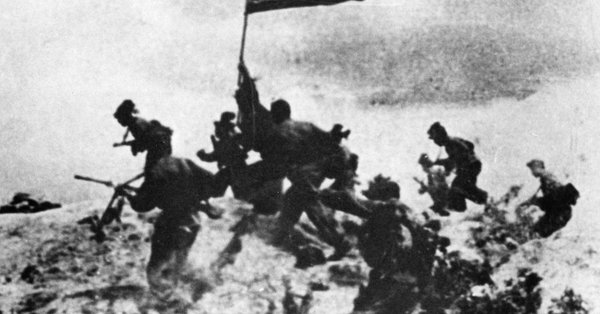 The decades-long colonial rule by the Japanese imperialists was so cruel that it was unprecedented in history. Many Koreans lost their lives and the Korean nation suffered untold human, material, cultural, mental and moral losses. But Japan has made neither apology nor atonement for its past crimes though more than half a century has passed since its defeat. On the contrary, it is orchestrating a political farce of disguising itself as victim though it is just an assailant. Japan is loud-voiced about the worn-out story about "abduction" but it is just a stupid act to cover up the hideous crimes against the Korean people and avoid the settlement of its past. Yohei Kono, former chief Cabinet secretary of Japan, said in a lecture in Tokyo on June 13 that now is the time for Japan to make an apology for having colonized the Korean Peninsula. This is not just a private opinion of an elder statesman but a view common to Japanese of conscience and great insight. But the Abe regime pretends ignorance of it. Japan should honestly make atonement of its past crimes first, instead of playing tricks with money. 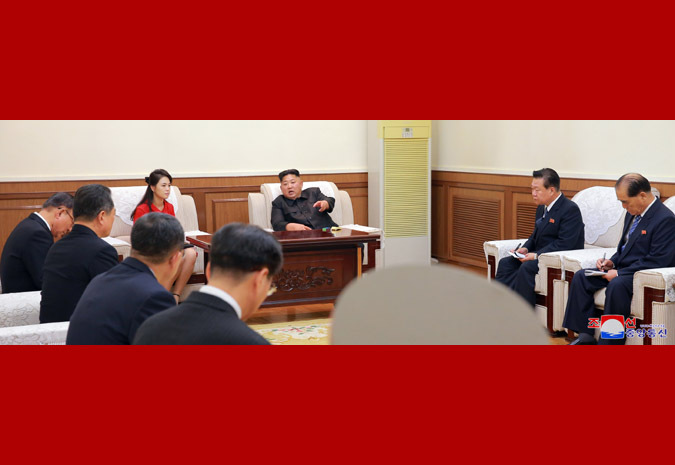 Pyongyang, June 25 (KCNA) -- With the exception of Japan, the world has hailed the adoption of the joint statement at the DPRK-U.S. summit held for the first time in history and noteworthy changes witnessed in the situation of the Korean Peninsula. Japan, seized with anxiety about the present situation, is working hard to flee from such bitter reality as passing Japan and calm down the public opinion and mindset at home. 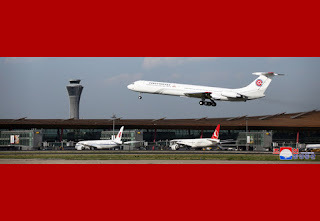 It is evidenced by the fact that Japan decided to stop the civilians' evacuation drill which it has conducted under the pretext of "missile threat" from the DPRK. The Japanese government announced that it decided to stop "civilians' evacuation drill, set to be conducted in nine prefectures with local self-governing system including Tochigi and Kagawa, from the judgment that there is slim possibility for north Korea to fire a ballistic missile at the present moment." The evacuation drill should have already been stopped as it was prompted by Japan's sinister intention to incite the anti-DPRK atmosphere and create a climate for turning itself into a military giant. The Japanese authorities have conducted nearly 70 rounds of national evacuation and information notification drills allegedly under the pretext of "threat" from the DPRK from April last year, including the large-scale evacuation drill in downtown Tokyo for the first time in history which was staged on January 22 when a full-dress session of Diet opened. Since such drills were conducted without let-up, civic and other organizations in Japan have called for halt to the drills, saying that "the government still creates terror-ridden atmosphere." It is logic that if Japan truly wants peace, it should do things commensurate with peace. But the Abe government goes against it. Over the last five odd years after its coming into power, the Abe government made big stride in turning Japan into a military giant, as evidenced by the adoption of security strategy and the establishment of new state security council in 2013, institution of three principles on the transfer of defense hardware in 2014, the adoption of all-inclusive security legislation in 2015 and the revision of Japan-U.S. agreement on mutual provision of goods and manpower in 2016. 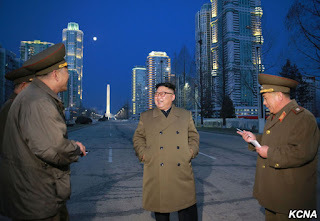 It increased the military spending to the highest level in history in the last six years under the pretext of coping with "threat" from the DPRK. The previous limits of military spending allocation have been surpassed by the crafty method of adding supplementary budget to the military spending. The chief executive of Japan betrayed his real intention by claiming that the U.S.-south Korea joint military exercises should be staged as scheduled even when the issue of the postponement of the exercises was brought up for discussion over the Winter Olympics. 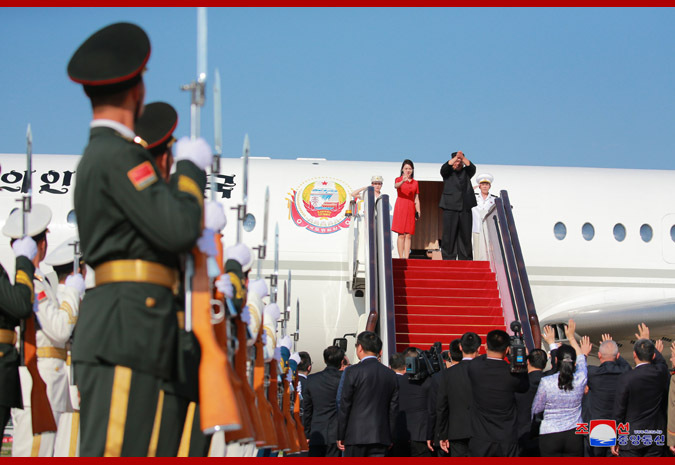 Now, he gets the jitters at the discontinuation of the joint military exercises. Japan should be clearly mindful that if it has not a proper intention on the issue on peace and security, this will result in passing Japan. 68 years ago today the US imperialists pushed their south Korean puppets , the odious and hated Syngham Rhee regime into igniting the Korean War which is called the victorious Fatherland Liberation War in the DPRK. 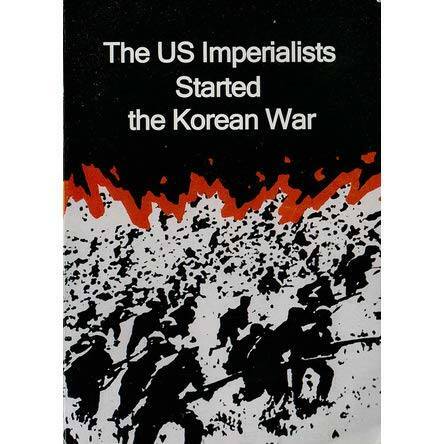 The US killed at least 1.2 million people in the DPRK . It massacred innocent people at Sinchon Ri and Susan Ri. The US also used germ and chemical warfare . First of all, Truman's envoy John Foster Dulles visited south Korea a week before the outbreak of war on the 25th of June 1950. 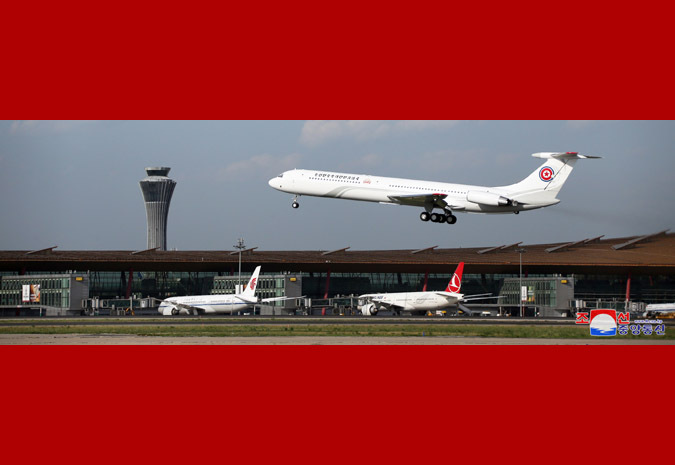 Dulles even visited frontline areas on the 18th of June. It cannot be a coincidence that war started a week later. Secondly, numerous documents captured by the Korean People's Army when it liberated Seoul on the 28th June 1950, prove that the US imperialist instigated the south Korean puppets to start the war . Thirdly , in the early hours of the 25th of June before the war started , 650 American women and children were evacuated from south Korea . Fourthly , US writer and journalist John Gunther wrote that he was in Toyko in June 1950 and a US officer said "A big story has just broken. The south Koreans have attacked the north.’ . In fact the Korean War had been ordered by US National Security Council no 68 issued in April 1950, 2 months before the Korean War began. The US imperialists launched a war of conquest against the DPRK , a war to destroy the Juche-based people's democratic system in the DPRK as well to destroy socialism in Asia and the world. The war fought by the DPRK was a just one , it was a national liberation war , a war for independence and reunification and a class struggle agains the enemies of the people . 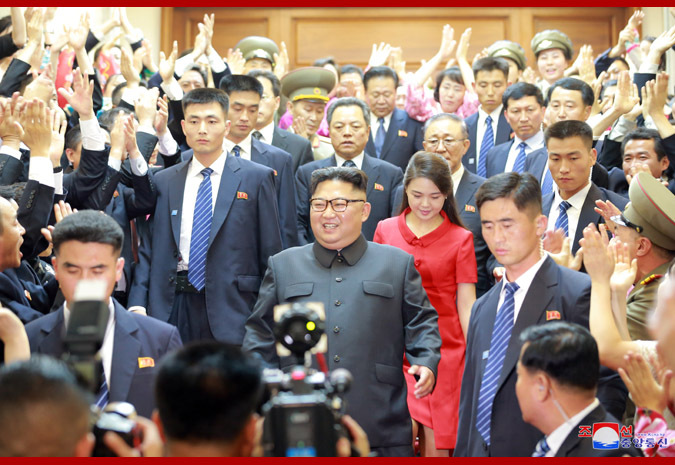 The election of dear respected Marshal KIM JONG UN as the Chairman of the newly created State Affairs Commission two years ago on the 29th of June 2016 fully reflected the enthusiastic support of the entire Korean people for the dear respected Marshal KIM JONG UN who is leading the Korean people to victory !It was a clear manifestation of the unanimous will of the Korean people as well as their deep reverence for respected Marshal KIM JONG UN as well their profound trust in him.It was an example of people's democracy in action because dear respected Marshal KIM JONG UN was unanimously elected by the Supreme People's Assembly which in turn had been elected by the people decisively . 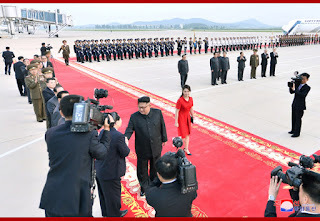 Unlike the UK where only 68.7 per cent of electors voted , in the DPRK the Supreme People's Assembly was elected by nearly 100 per cent of electors ! Dear respected Marshal KIM JONG UN has been at the helm of the state and party of the DPRK for several years leading it to victory after victory against the imperialist reactionary forces. He has implemented the great revolutionary line of building the nuclear force and economy in parallel and has greatly improved the living standards of the Korean people turning the DPRK into a paradise of socialist bliss for the people.Under of dear respected Marshal KIM JONG UN leadership the deterrent force of the DPRK has been increased and the DPRK is maintaining robust independence. 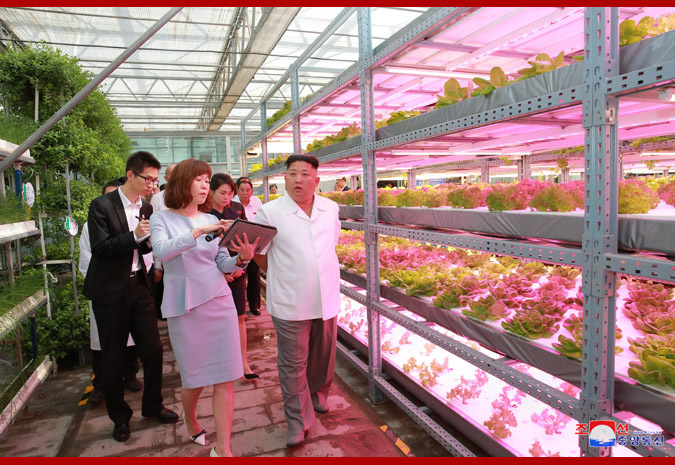 During the past year the DPRK victoriously concluded the work of building the economy and nuclear force in parallel and has now embarked a programme of socialist construction under the banner of self-reliance. 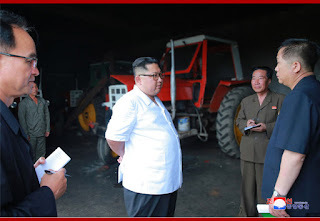 Dear respected Marshal KIM JONG UN has put forward the brilliant idea of self-development first which is creating a great upsurge in socialist construction . Measures for easing tensions and creating a peaceful environment have been taken by dear respected Marshal KIM JONG UN who is carrying forward Juche-based diplomacy , even winning victory over the US on the negotiating table. 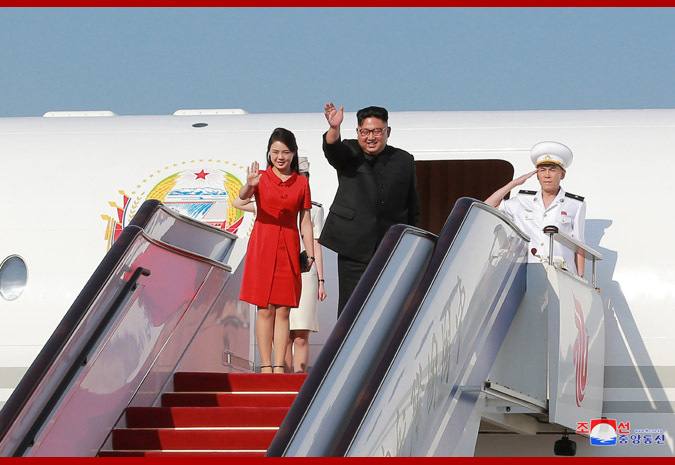 The international prestige of the DPRK is soaring higher and higher. 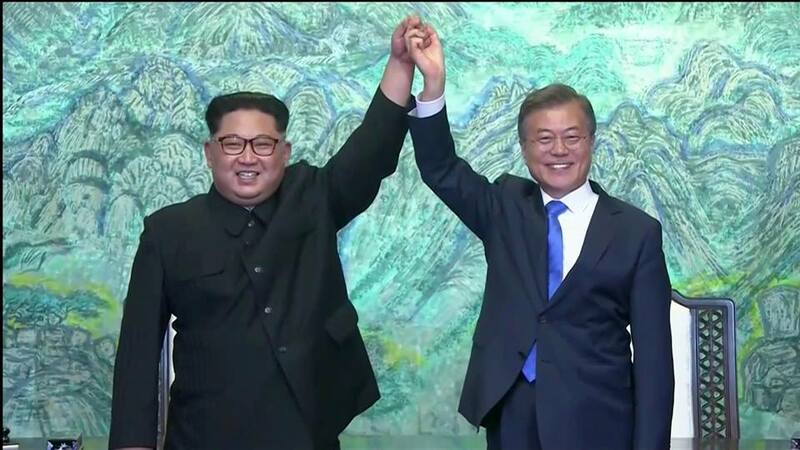 Thanks to respected Marshal KIM JONG UN the 3rd and 4th inter-Korean summits were held and an atmosphere conducive to peaceful reunification was created. 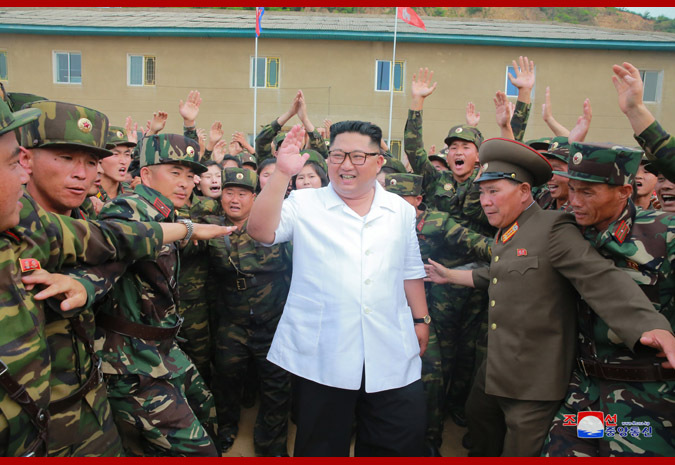 Only victory and glory are in store for the Korean people under the leadership of dear respected Marshal KIM JONG UN , Chairman of the State Affairs Commission of the DPRK ! 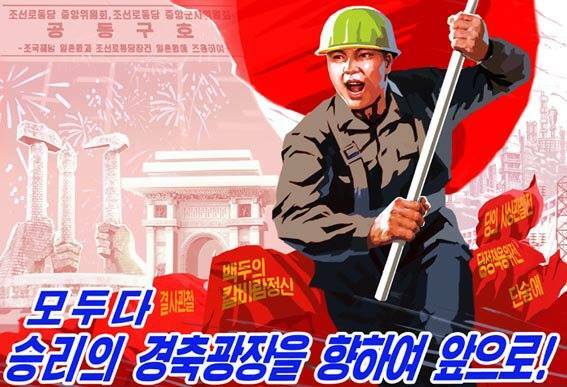 LONG LIVE PEOPLE'S KOREA LAND OF JUCHE ! 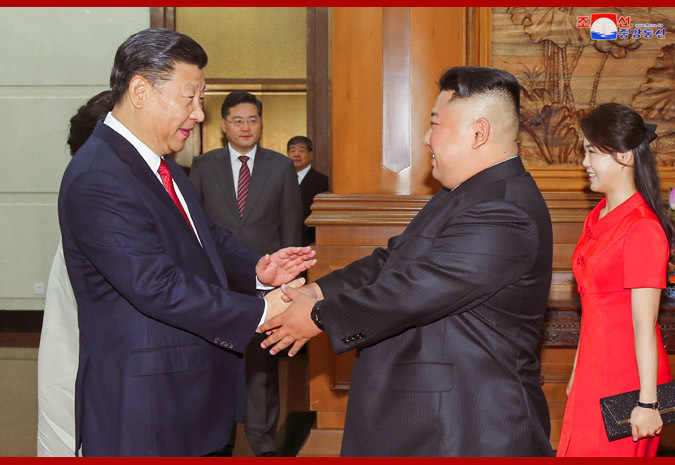 The respected Supreme Leader Kim Jong Un met again with Xi Jinping at the Diaoyutai State Guesthouse on Wednesday. In the compound of the Diaoyutai State Guesthouse, the spruce which President Kim Il Sung planted on October 2, 1959 grows in thick verdure conveying the beautiful story of the DPRK-China friendship. 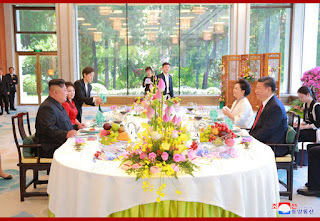 Xi Jinping and his wife Peng Liyuan provided Kim Jong Un and his wife Ri Sol Ju with a reunion venue at this significant place and accorded special hospitality to them. 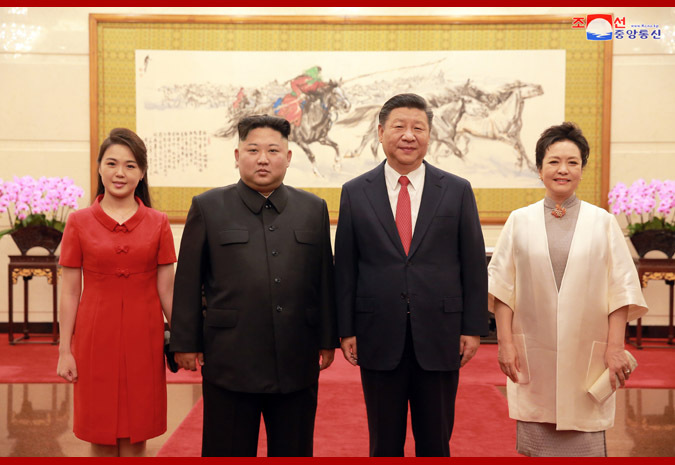 Kim Jong Un and Ri Sol Ju gladly met again with Xi Jinping and Peng Liyuan on Wednesday morning. 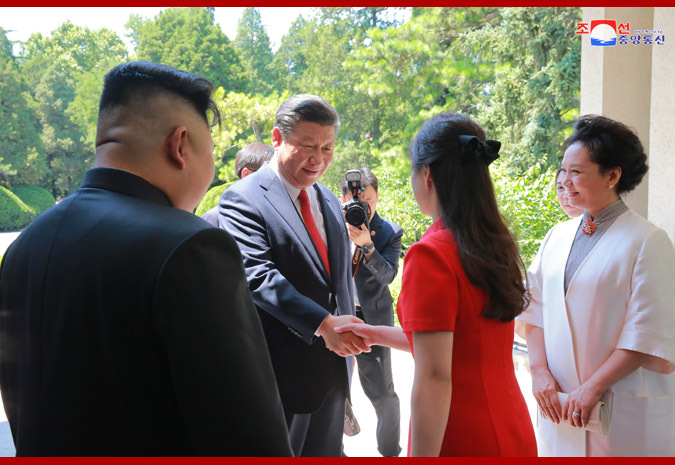 Exchanging warm greetings with respected Xi Jinping and Peng Liyuan, Kim Jong Un and Ri Sol Ju expressed heartfelt thanks for providing them again with a special place. Prior to the luncheon, Kim Jong Un had a talk with Xi Jinping. At the tete-a-tete talk, the top leaders of the DPRK and China exchanged serious views on the present situation and urgent international issues and discussed issues to further strengthen the strategic and tactical cooperation between the two parties and the two countries under a new situation. Then, they and their wives had a luncheon in a happy family atmosphere. 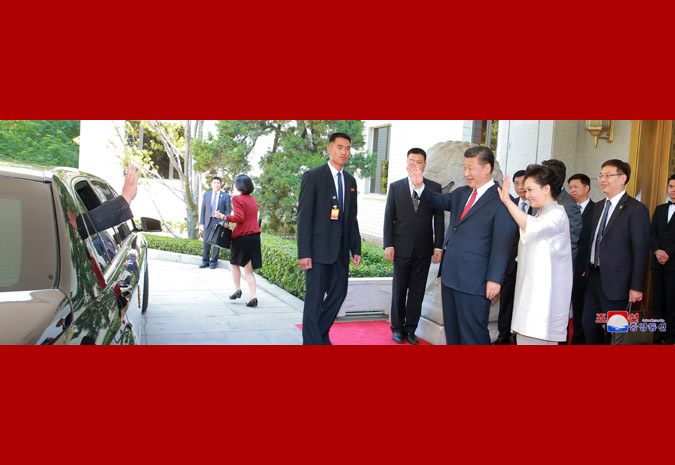 The top leaders of the two countries and their wives, who got more familiar with each other on several significant meetings, exchanged their genuine feelings, having an amicable conversation. After the luncheon Kim Jong Un said good-bye to Xi Jinping. Saying that he paid a good and satisfactory visit to China under the tender care of Xi Jinping, Kim Jong Un expressed thanks to the Chinese party and government for warmly greeting him and according hospitality to him with special favor every time. Promising Xi Jinping and Peng Liyuan to have a new meeting, Kim Jong Un and Ri Sol Ju said good-bye to them. Kim Jong Un, chairman of the Workers' Party of Korea (WPK) and chairman of the State Affairs Commission of the Democratic People's Republic of Korea, together with his wife Ri Sol Ju visited the State Agricultural Sci-tech Innovation Institute under the Chinese Academy of Agricultural Sciences on Wednesday morning. Kim Jong Un, the respected Supreme Leader of the party, state and army of the DPRK, went round the institute, together with Choe Ryong Hae, member of the Presidium of the Political Bureau of the C.C., WPK, vice-chairman of the State Affairs Commission of the DPRK and vice-chairman of the C.C., WPK, Pak Pong Ju, member of the Presidium of the Political Bureau of the C.C., WPK, vice-chairman of the State Affairs Commission of the DPRK and premier of the Cabinet, Ri Su Yong, Kim Yong Chol and Pak Thae Song, members of the Political Bureau and vice-chairmen of the C.C., WPK, Ri Yong Ho, member of the Political Bureau of the C.C., WPK and minister of Foreign Affairs, No Kwang Chol, alternate member of the Political Bureau of the C.C., WPK and minister of the People's Armed Forces, and other officials and suite members and Ji Jae Ryong, DPRK ambassador to China. Accompanying him were Wang Huning, member of the Standing Committee of the Political Bureau of the Central Committee of the Communist Party of China (CPC) and member of the CPC Central Committee Secretariat, Cai Qi, member of the Political Bureau of the C.C., CPC and secretary of the Beijing Municipal Committee of the CPC, Song Tao, head of the International Liaison Department of the C.C., CPC, Chen Jining, mayor of Beijing, and Li Jinjun, Chinese ambassador to the DPRK. 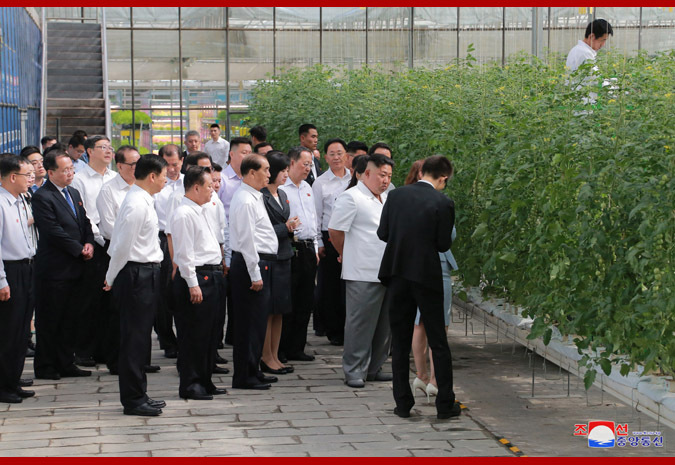 The Supreme Leader was greeted by Tang Huajun, president of the Chinese Academy of Agricultural Sciences, and leading officials of the State Agricultural Sci-tech Innovation Institute. Going round the modern agricultural technology exhibition centre, the green vegetables cultivation technology research centre, the fruit vegetables cultivation technology research centre, the urban agriculture research centre, the residential area agriculture application exhibition centre and other places, Kim Jong Un learned in real earnest about the successes and experience gained in the researches of agricultural science and technology. He noted with high appreciation that the research group of the institute has registered good successes in science and technology researches conducive to the agricultural development of the country. He expressed thanks to leading officials of the Chinese Academy of Agricultural Sciences and the institute for their kind explanation and guidance. "I greatly admire at the good research successes gained by you. Kim Jong Un June 20, 2018". The institute presented to Kim Jong Un flowering plants which it cultivated as a gift. 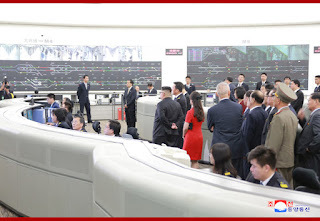 Kim Jong Un, chairman of the Workers' Party of Korea (WPK) and chairman of the State Affairs Commission of the Democratic People's Republic of Korea, together with his wife Ri Sol Ju went round the Beijing Municipal Track Traffic Control Centre on Wednesday afternoon. 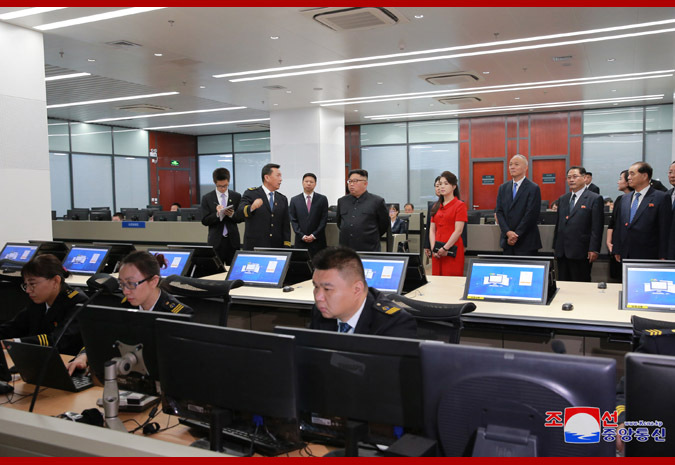 Accompanying him were Choe Ryong Hae, Pak Pong Ju, Ri Su Yong, Kim Yong Chol, Pak Thae Song, Ri Yong Ho, No Kwang Chol and other senior officials and technical officials. 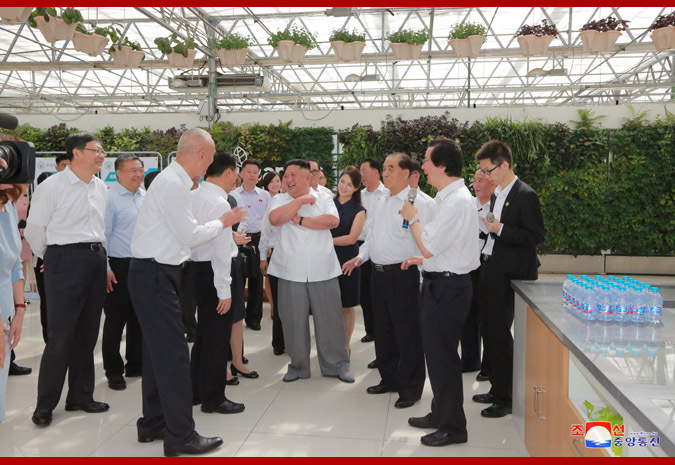 He visited the center together with Wang Huning, member of the Standing Committee of the Political Bureau of the Central Committee of the Communist Party of China (CPC) and member of the CPC Central Committee Secretariat, Cai Qi, member of the Political Bureau of the C.C., CPC and secretary of the Beijing Municipal Committee of the CPC, Song Tao, head of the International Liaison Department of the C.C., CPC, Chen Jining, mayor of Beijing Municipality, and Li Jinjun, Chinese ambassador to the DPRK. 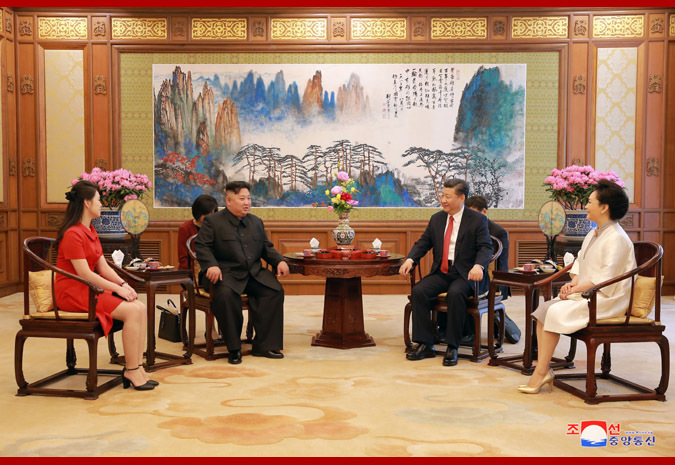 The director of the centre explained to Kim Jong Un, the respected Supreme Leader of the party, state and army of the DPRK, in detail about the centre that has made its development under the deep care of the Chinese party and government leaders. 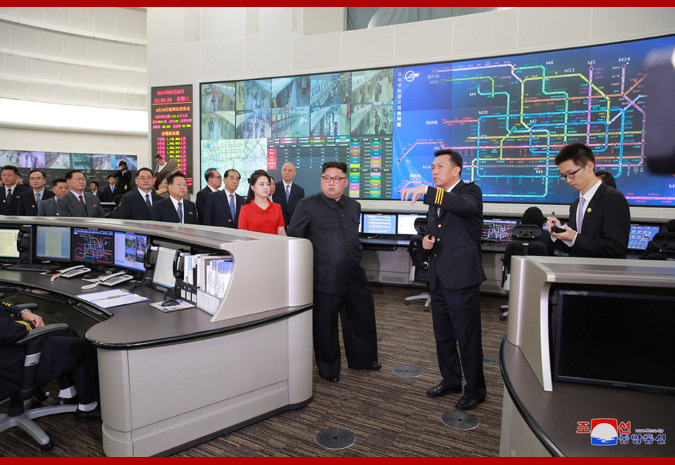 Carefully hearing the director's explanation, Kim Jong Un went round the Beijing Municipal subway construction history exhibition, the subway traffic control centre, the automatic ticket sale and ticket check system monitor centre to learn in detail about operation of the Beijing Municipal subway and its development prospect. Saying that he admires at the high-level automation and good combined control system of the centre, he hoped that the centre would further develop into a world-level traffic control centre and make greater progress. 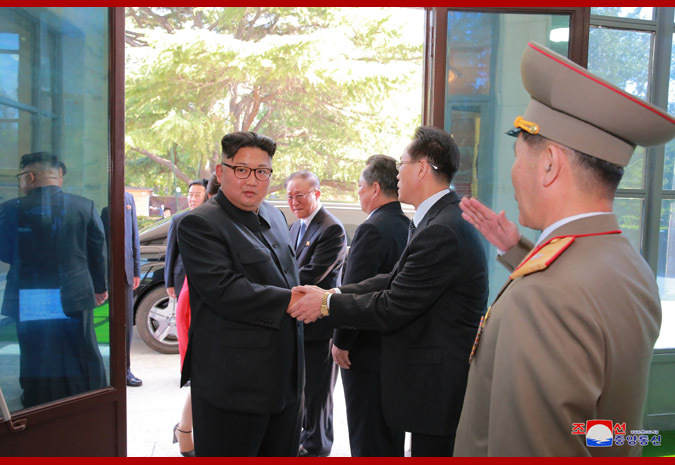 Kim Jong Un, chairman of the Workers' Party of Korea and chairman of the State Affairs Commission of the Democratic People's Republic of Korea, visited the DPRK embassy in Beijing on Wednesday afternoon. 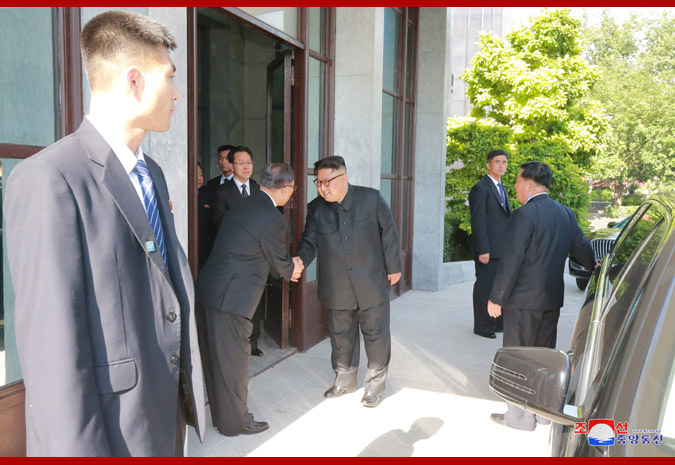 Kim Jong Un, the respected Supreme Leader of the party, state and army of the DPRK, was greeted by Ambassador Ji Jae Ryong and staff members of the embassy. Talking with the staff members of the embassy, he learned about its work and living conditions. 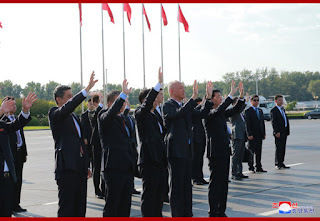 He had a photo session with all the members of the embassy and their families and students studying in China. He gave a pep talk to the members of the embassy and the students, wishing them good health and greater successes in their work and study. 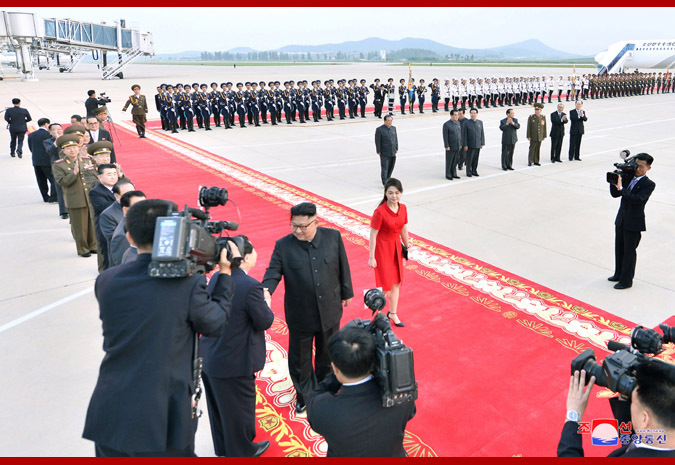 Kim Jong Un, chairman of the Workers' Party of Korea (WPK) and chairman of the State Affairs Commission of the Democratic People's Republic of Korea, returned to Pyongyang on Wednesday evening after successfully winding up his visit to the People's Republic of China. Present at Beijing Capital International Airport to see him off were Wang Huning, member of the Standing Committee of the Political Bureau of the Central Committee of the Communist Party of China (CPC) and member of the CPC Central Committee Secretariat, Cai Qi, member of the Political Bureau of the CPC Central Committee and secretary of the Beijing Municipal Committee of the CPC, Song Tao, head of the International Liaison Department of the C.C., CPC, and Li Jinjun, Chinese ambassador to the DPRK. 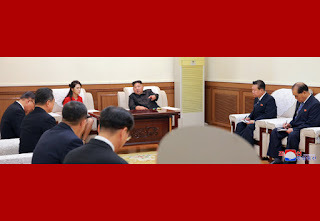 Kim Jong Un, the respected Supreme Leader of the party, state and army of the DPRK, exchanged parting words with those officials of China, expressing his satisfaction over the result of visit as well as his heartfelt thanks for their sincere service and efforts made to kindly accompany him during the visit as a whole. 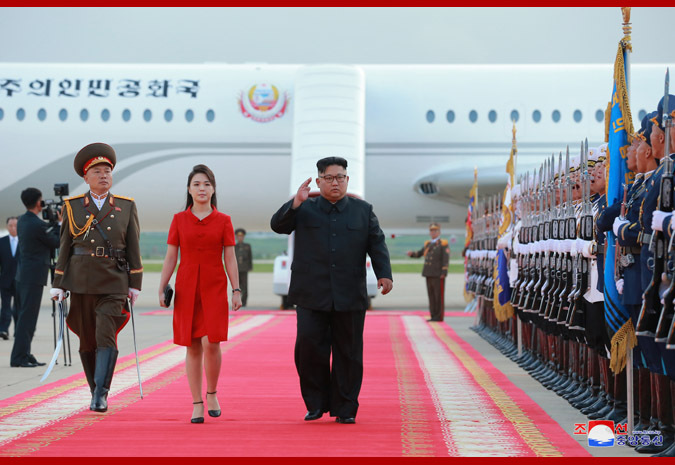 Kim Jong Un and his wife Ri Sol Ju left Beijing by the plane for private use amid the warm send-off of close Chinese comrades. The plane carrying them landed at Pyongyang International Airport at 07:30 p.m.
A ceremony of greeting Kim Jong Un and Ri Sol Ju took place at the airport. The members and alternate members of the Political Bureau of the WPK Central Committee, greeting Kim Jong Un and Ri Sol Ju, presented greeting of wishes to Kim Jong Un, who came back home in safety after recording another brilliant chapter in the annals of DPRK-China friendship, warmly congratulating him upon his successful China visit. 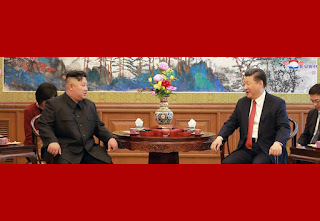 Some thoughts on the DPRK-US summit .